At last the sun is starting to shine and summer appears to have arrived! Everyone knows the dangers of UV from the sun and uses sunscreen to protect their skin when it’s hot, but we shouldn’t forget to protect our eyes as well. Spending time outdoors for longer is one of the pleasures of the summer months, but studies show that exposure to bright sunlight may increase the risk of developing cataracts, age-related macular degeneration and growths on the eye, including cancer. Using tanning beds also carries the same risk, so if you use them you should ensure you protect your eyes. UV radiation, whether from natural sunlight or artificial rays, can damage the eye’s surface tissues as well as the cornea and lens. Unfortunately, many people are unaware of the dangers UV light can pose, but by wearing UV-blocking sunglasses you can enjoy the summer safely whilst lowering your risk for potentially blinding eye diseases and tumours. It is important to start wearing proper eye protection at an early age to protect your eyes from years of ultraviolet exposure. 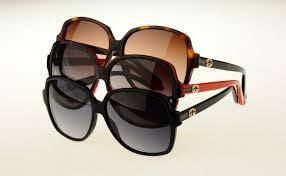 Choose sunglasses that block UV rays. Don’t be led by colour or cost. Just because your sunglasses lenses are very dark, or they cost you a lot of money, it doesn’t mean they will protect your eyes from UV light. Make sure your sunglasses block 100% of UVA and UVB rays. Choose a style which wraps all the way around to your temples, so that the sun’s rays can’t enter from the side. Don’t rely on contact lenses. Even if your lenses have UV protection, remember to wear your sunglasses too. Wear a hat as well as your sunglasses. Wide-brimmed styles will give you the best protection for your eyes. Don’t think that you’re safe because it is cloudy. The sun’s rays can pass through haze and thin clouds and sun damage can occur at any time during the year, so make sure you wear sunglasses whenever it’s bright, not just in the summer time. Don’t forget children and older members of the family. Make sure they protect their eyes with hats and sunglasses too. Never look directly at the sun. Looking directly at the sun at any time, including during an eclipse, can lead to solar retinopathy, which is damage to the eye’s retina from solar radiation. If you have had enough of your glasses or contact lenses and want to find out how laser eye surgery or any of our other vision correction treatments can transform your life, then why not contact AVC today on 020 7935 7497 or email on info@advancedvisioncare.co.uk where our expert advisors are ready to answer your questions and to help guide you the through the process.